Real Ideas, tips, and tutorials about how to make honest money online. ZipNadaZilch, have you heard of it? It's a website that claims to offer money and prizes for a given number of referrals. But is it real or just another 'get rich quick' scam? I feel that they picked a name that doesn't do the company any justice. When I hear zipnadazilch.com, red flags start to go off as far as being able to trust a company. Don't you agree? Well after doing due diligence, I was fairly convinced it is probably not a scam. Maybe not 100% the real deal, but also not a scam. ZipNadaZilch has been around for over 7 years and they are still rated an (A-) on the Better Business Bureau website. They appear to be very honest and up front about what you are getting yourself into. The ZipnadaZilch progam requires that you must be a taxpaying U.S. citizen over the age of 16 with a valid credit card to join. 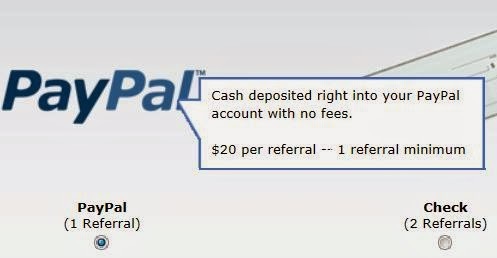 I personally advise each of my potential referrals that it is also best to have a Paypal account since Zipnadazilch pays daily using this method as long as you have at least 1 referral. Paypal is not required, but the alternative payment method is by weekly check with a 2-referral minimum requirement. When Do You Earn your Referral Bonuses? After you've earned your 1.0 credit on your account, you now qualify to earn referral bonuses and prizes for the life of your account. Depending on which program you are enrolled in, your referral payments are anywhere from $20-$120+. I'm enrolled in the ONE ZipNadaZilch program so my referral payments are only $20 but it's much easier to get referrals in this progam. Higher paying accounts require more free trials to earn your 1.0 credit making it harder to find referrals willing to join. So for now One Zipnadazilch suites me just fine and I figure since I make a few of these $20 bonuses a day I really have no need upgrade to higher accounts. After a lengthy google search for reviews on the site, I had seen alot of 'Proof of Payment' photos. But with all the image altering software out there, it's easy to assume they're all photoshopped. So instead of believing everything I read over the Internet, I instead went directly to the friend that referred me. The day that she referred me, she also referred 5 other people in under 2 hours and here was her $120 deposit proving it. Since Jennifer was a friend of mine, I had the luxury of just taking her word for it. ZipNadaZilch also recognized the problem with convincing potential referrals with proof of payments. They started a section on their site where members post their proof of payment pictures. Although it still doesn't "prove" payment, it was a bit reassuring when I was deciding to join. 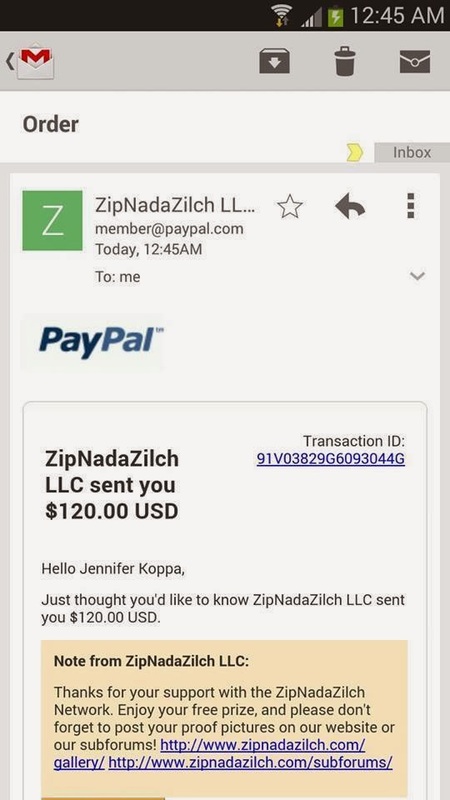 Although Zipnadazilch will probably never offer me a full-time income, I can and do make a good share of my online income with it. On a good day, I average $100+, and on bad days I'm lucky to make a single referral. But on average, I have been earning about $60 per day with only a few hours per day invested towards ZNZ marketing. I will gladly take you on as a referral if you'd like to join the team I've recently joined. There is a group of 300+ of us on a private Facebook page that act as a support group giving advice and ideas on how to get referrals as well as training litereature, prewritten ads and info on where to post them. 300+ people can't be wrong...with a support team like that, you're bound to bring in some profit don't you think? 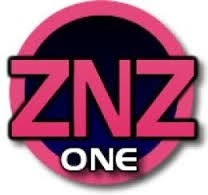 Out of courtesy, if someone else referred you to ZNZ first, please do not sign up under my referral link. My reviews on this site are completely open and honest. I won't try to convince you to sign up if I didn't believe you could profit from it. So for the time being, I'll give this program 1 1/2 thumbs up. Should anything sketchy come up, I will update this post and warn of any possible dangers to anyone wanting to sign up. Feel free to post your comments or questions below and I will try to respond as soon as I can. GOOD LUCK! *Disclaimer* - The opinions and views expressed on this post are solely mine. I give you no guarantees, and I strongly suggest you do your own due diligence before participating in any money making programs online. As with any and all money making programs online, enter at your own risk. I've heard of this company, but I've never tried it. Your review was very helpful. How much have you made? That link led me to a lady named Ty Miranda (is it you?) I couldn't find any pictures of your 'proof of pay'. Thanks for the reply however. Copyright © 2012 Tips For Online Income. All rights reserved.